A Singing Beach Club Wedding Photographer captures images from beautiful New England summer weddings. The Singing Beach Club has the classic elegance and vintage charm that one would expect from a Manchester-by-the-Sea wedding event. The couple pictured had a tent reception that was filled with light, laughter, and love. 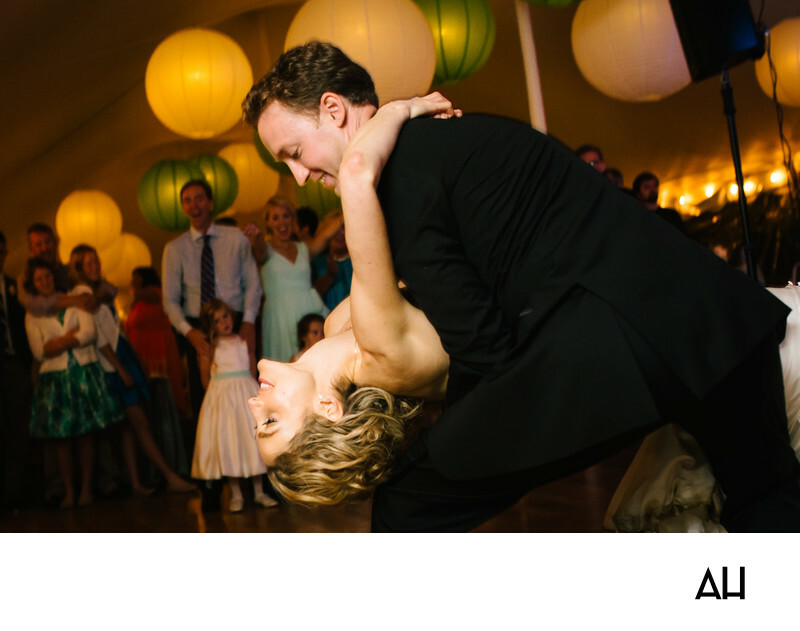 In the image, the bride and groom share their first dance as a married couple in the center of the tent. The space around them glows with the lights of giant, round, yellow and green lanterns. The lanterns add a whimsical ambiance to the evening, and they almost seem to float along the ceiling. As the guests cheer the newlyweds on, the groom tips the bride back in a graceful dip. He smiles down at the beauty who is now his wife, the woman he has vowed to love and cherish for all of his days. The bride grins as she throws her head back in the happiness of the moment and feels the support of her husband holding her steady. The picture shows just how comfortable the bride and groom are with one another. It is immediately obvious that they have fun being together, they trust one another, and that they are deeply, madly in love. Watching them spin about the dance floor together was a joy for all who attended the event. The expressions on the faces of the family and friends who stand around them truly says it all -- this is couple who were meant to be, and this was a day that will be remembered for a lifetime.